Ian describes the gigs they play in a candid and honest way, from the triumphant ('...I can hardly write for the excitement') to the badly-organised ('...if ever a gig should have been pulled it was this one'). He also goes in to the minutiae of being in a band, describes flying in detail ('...the seats recline and they even have movies...' - bear in mind that in 1972 flying was still only really available to the well-heeled), how band finances work, and also the recording process from the genesis of a song to the final finished LP and all the pitfalls on the way. Ian is a witty and engaging writer. This is no dull travelogue - this is a real page-turner, building to a climax at the end. As the winter weather closes in, will they, won't they make it to the last gig in time? Read the book and find out! There are books a-plenty on the music business, be they biographies of the musicians, the bands, the genres or even the managers but there are very few books if any that describe what it's like to be in a band on the road, especially one that is on the cusp of success after years of hard graft. 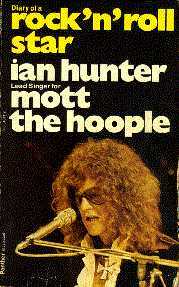 As such this book is essential reading for anyone with a love of rock music. This 2018 issue includes a foreword by Johnny Depp, describing Ian as a reluctant rock 'n' roll legend and putting him up there with luminaries such as Mick Jagger and Paul McCartney. His fans have known this for years, but for the casual purchaser such praise is necessary. There is an introduction by Mott/Ian biographer Campbell Devine describing the background to the diary, informing us for example that the pawn shops they frequented were often in the roughest part of town (which, in the USA, means very rough indeed). The main text is interspersed with many (1972-era) photos that are new to this edition. We also get Ian's much shorter Japan Diary, which is an account of Ian's short 2015 tour (his first there) which was first published in Mojo magazine. Finally there is a short 'afterword' by Ian. All in all, an excellent reissue and as essential as ever. 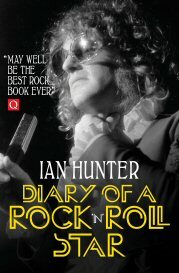 For many years, the only book (apart from Willard Manus' novel which supplied the name) has been Ian Hunter's Diary of a Rock and Roll Star (published in the States under the title Reflections of a Rock and Roll Star), which was written during Mott's November/December 1972 tour of the USA. It was written as it happened - on the plane, in hotel rooms, wherever. It chronicles the endless travelling, the hotels, sound-checks, performances... it strips away the glossy facade of the rock star the PR people would have us believe and lays bare what life is really like on the road. Originally published in 1974, it was a best-seller for two years before the publishers discontinued it to concentrate on other titles. Thus, Diary gained cult status, becoming increasingly difficult to find, even in secondhand bookstores. But over the years, demand remained strong, until finally Ian's wife Trudi bought the rights to it (without telling Ian!). Diary was re-published in 1996, this time by International Music Press. It had a new foreword by Andrew Collins (of Q magazine), and new notes on the back cover, but was otherwise identical to the original (as you would expect). Oh, and the price had gone up to GBP8.95 - my original 1974 copy cost 50p! It is, sadly, out of print again. Ian says he is waiting for the right offer to come along - let's hope we don't have to wait too long. The October 1996 issue of Q magazine has given it a good review, saying that it "may well be the best rock book ever". I have heard from several people that it is certainly the best-written rock book... indeed, in the mid-1990's Per Stam from Sweden presented a paper at a literature/culture studies conference comparing Diary with Umberto Eco's Travels in Hyperreality, where he gave Hunter's book some praise and Eco's some complaints. 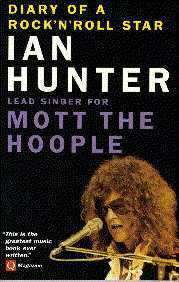 Even if you are not a fan of Ian or Mott, this book is essential reading for any rock fan.